Find a way to play some of the songs you love in the classroom. Chances are you’ll have some loaded onto your device, and you’ll just need a boom box and a way to connect your headphone jack to the boom box. If not, get a few YouTube links ready to play on the projector. When you remember your favorite teachers, it’s nearly certain it’s how they made you feel good about yourself, not the exact points of what they taught you, that you remember. And, sadly, when you remember your least favorite teachers, you also recall the way they made you feel, but in a negative way. In short, humans connect through the heart, which is how and why songs and stories impact us. And while we connect by telling stories, much more important is that we connect by listening to stories. Throughout the school year, you’ll discover that you can strengthen your bonds with your story ninjas by giving each one your full attention when possible. So if the first reaction you show to a story ninja’s piece of writing is a positive emotional response to the story itself, your story ninja will love delivering more stories to you. The title of a New York Times nonfiction bestseller says it so well: Listening Is an Act of Love. Have your story ninjas make a list of three of their top songs, top books and top movies, along with short notes on how each song, book and movie made/makes them feel. 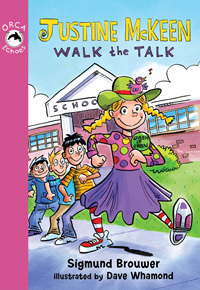 In Justine McKeen, Walk the Talk, the second book in the Justine McKeen series, Justine decides there are too many cars idling in front of her school. So she comes up with a solution that should help keep the air cleaner. But she soon discovers not many adults trust her crazy ideas.